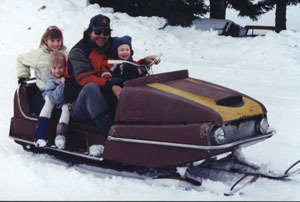 There`s nothing better than taking all the kids for a ride on a warm winter day on my 1970 ski bee commander..
Ski-Bee was made by the Ingham brothers. The SKI BEE Commander could hold three passengers. A great place to-be is on a Ski-Bee! My 1970 Ski-bee commander.single cylinder sach engine.